The temperature has dropped over the past few days. The sidewalks are covered with fallen leaves. The air is crisp and frigid. The entire landscape has changed dramatically as if someone has waved a magic wand and the greens are replaced by an explosion of varying shades of amber. Sandals and flats are now replaced with boots. I've succumbed to chunky knits in order to stay warm. Daylight saving begins tonight and the Christmas market will be opened in less than a month. Christmas is only less than 2 months away. What an exciting and magical time of the year. ** my apologies for constantly changing the font but I've been trying to settle on something that's easier on the eyes. I'd love to hear your feedback. Numpty here went out in ballet pumps today - what an idiot, I have never been so cold in my life. Eeeek, Tabitha. You brave woman. I did that last week when the temperature hovered around 13˚C and I froze. It's even colder this week! Stay warm, M! We have a hurricane coming our way here. >< Btw, I like this font, much easier on the eye. I like this font you're using. It's easy to read. This is easily one of my most favourite photos of yours - love it so much! It's the suddeness of the change that gets me but am more prepared this year. Hope you can stay warm and cosy! It has just turned arctic and we had a smattering of snow last night. Time for the big knits and the Uggs to make their appearance again. I forgot to comment about the font. The Time New Roman(?) style font is nice but not so in keeping with the current styling on your blog and title headings. Arial seems more contemporary and reads well - it seems cleaner. Does that help? I only realized today that it has suddenly turned cold. Or at least colder than the last week. I stepped out in bare legs...big mistake. Time to get those woolly tights out. Such a beautiful photo Marlene, stay warm! I'm browsing your blog in my tiny iPhone right now and the font is very clear and legible. Good choice! Christmas spirit is everywhere here now. Love the beautiful photo, looks so real. Love the colours of autumn but hate the colder temperature! I've been wearing boots since August, but that's just me. :) Hubs and I went to a play last night and ran straight to the car afterwards, it was so cold! I was starting to experience fall in the midwest, but since moving to California, am experiencing warm weather again :) Love the cozy layers associated with fall though! Waauw, I've been staring at that pic for a while? dit you take it, it's wonderful! Thank you! 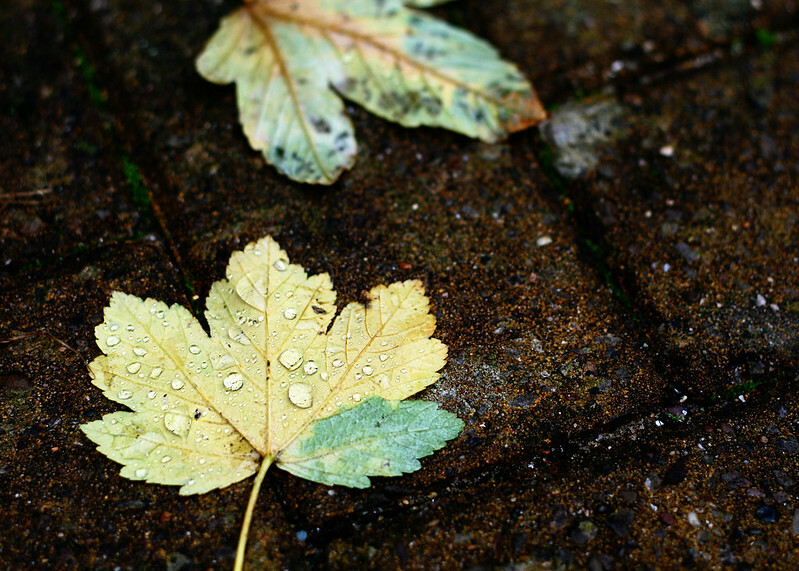 Yes, I photographed the leaves right outside my doorstep. I cannot believe that summer's over, we're well into fall and that it's nearly Christmas! Where did the year go!? On the weather front, we're bracing for a hurricane here in NY... so it's getting cold! Hope you had a lovely weekend! I like this font, it is easy to read. I love looking up and down when walking around. I once spotted a feather and a leaf so nicely positioned - like they fell there just waiting for me to take a picture. This photo is gorgeous! This picture is amazing! It's so cold over here, really need to adjust to these temperatures each year. I think I will never get used to the cold. I like this Times New Roman font by he way. Such a beautiful time of the year especially in the UK. The picture is really beautiful. Such a lovely autumn photo. I'm appreciating autumn more and more each day- so gorgeous.